Could these be the faces of the USS Monitor? Produced by forensic anthropologists from Louisiana State University working with skeletal remains recovered from the Monitor’s turret in 2002, the sculptures were unveiled Tuesday during the dedication of a plaque in memory of the crew at the Navy Memorial in Washington, D.C. They will join the collection of Monitor artifacts maintained by the Newport News-based Monitor National Marine Sanctuary and be used in future exhibits and education programs, including those at the USS Monitor Center of The Mariners’ Museum. “These are the faces of men who gave their lives for their country at a pivotal moment in American history,” said David Alberg, superintendent of the sanctuary, which was established by Congress in 1975 to protect the Monitor wreck site. Originally discovered by Navy divers during the recovery of the gun turret from the ocean floor in 2002, the remains were retrieved by archaeologist Eric Emery of the Joint POW-MIA Accounting Command in Hawaii during the excavation of the huge artifact at the Mariners’. Both skeletons were well-preserved and nearly complete after more than 145 years in their silt-filled tomb, enabling forensic scientists to determine that one sailor was between 17 to 24 years old and about 5 feet 7 inches tall, with relatively good oral hygiene. The other man was about one inch shorter, between 30 to 40 years old and probably smoked a pipe. Though the Monitor’s crew included at least one African-American, both sets of remains have been identified as white. 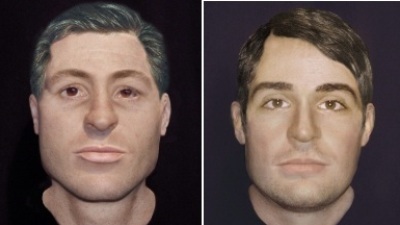 Numerous other details about their physical characteristics have been determined since their discovery, but their names remain a mystery that NOAA hopes to solve by releasing the images of their reconstructed faces to the public. “We don’t know all the answers about their lives but the reconstruction is a way to bring the past to life, to create something as similar as possible to the original,” said Mary H. Manhein, director of LSU’s Forensic Anthropology and Computer Enhancement Services Laboratory, which volunteered to create the facial reconstructions through a combination of scientific and archaeological research, 3-D clay facial reconstruction, computer-generated modeling and computer-enhanced imaging techniques. Designed by Swedish-American naval engineer John Ericsson, the landmark Monitor and its revolving gun turret rewrote naval history when it met its Confederate counterpart — the CSS Virginia — in Hampton Roads during the March 9, 1862 first battle between ironclad warships. But less than a year later — while traveling under tow — it capsized and sank off Cape Hatteras in a New Years’ Eve storm with the loss of 16 crew members. Retired Monitor Sanctuary superintendent John Broadwater, a marine archaeologist who was among the first to explore the Monitor wreck site after it was discovered in 1973, led the joint NOAA and Navy expeditions that recovered such hallmark artifacts as the propeller, steam engine and turret. He said the facial reconstructions add another layer to the Monitor’s story.